What did we plan to send? The Paris Universal Exposition of 1867. Where the Exhibition is likely to be defective is in group four – garments, tissues for clothing, and other articles of wearing apparel. Our manufacturers are prudently cautious of competing with Europe in these particulars. There will, however, be an exhibition of garments of a very novel kind, and of thorough and complete American origin. Brief in their nature and brilliant in their color, they will, we doubt not, attract universal attention. They will be exhibited on the backs of the wearers, so that the fit may be appreciated. In short, a company of American Indians, in their war paint and other simple articles of clothing, will be contributed by MR. ROWLAND, Indian Agent and Commissioner from Minnesota, Dakota, Montana and Idaho. MR. BECKWITH, the United States Commissioner General in Paris, was most urgent on the subject of sending a collection of North American Indians, and mainly through his exertions space was obtained in the grounds of the Exposition for the erection of wigwams. The tribes represented are the Sioux, the Dakota, and the Chippewa. They will, together, number fifty persons, male and female, adult and juvenile. MR. ROWLAND’S position enables him to pick out only those who are genuine types of their race. He will make a selection of all the implements of peace and war used by the children of the forest, and in the grounds of the Exposition they will illustrate the uses to which they are put. It may be doubted if such a numerous and authentic collection of aborigines has ever before been seen in Europe. The red man disappears so rapidly before the footsteps of his white brother that it may also be questioned if a similar collection can ever again be made. I was quite excited to find this description and thought for sure I would be able to learn more about the agent putting the Native group together here in the U.S. and perhaps identify a few of the key men in the Native troupe. Is this Rowland fellow for real? I searched high and low for any sign of an Indian agent named Rowland. Most Indian agents are very active in this time period with lots of newspaper coverage. No sign of him. No hint anywhere that Minnesota, Montana, and Idaho were ever grouped together as an Indian district. No hint the Sioux and Chippewa were ever grouped together under one Indian Agent. No evidence online this person ever existed. Of course it is possible the information is just not online or he served for such a short time as to never make the news. But it does seem unlikely to me. Why would the New York Times report on this man if he wasn’t for real? I may never learn the answer to this question, but after weeks of research it seems to me someone is running a con on somebody. Someone is perhaps trying to cash in on the possibility of profits and fame. Is the reporter part of it or is he being duped along with the public? I also found it curious the reporter and Mr. Rowland are making a point to tell the public only Indians that properly fit the idea of what an Indian is will be selected. Are there really a lot of impostors running around? I suppose they might be suggesting that many Native People are mixed blood and so not really Indians. It is hard to tell for sure just what might be behind the comment, but it certainly is curious. I wonder who was planning to foot the bill for the transportation, room, and board of 50 people? Certainly not Congress, who the NY agent complains nitpicked every little expense. Would an Indian Agent make enough money to foot the bill privately? Perhaps, if he were corrupt, but then why turn around and spend his ill-be-gotten profits on the Indians being robbed? I suppose the thoughts of greater profits could be incentive. The Expo was scheduled to open April 1, 1867. The above information was published in late January. This leaves February and March to gather up 50 willing Natives, transport them to New York, equip them with the materials needed to erect a village and demonstrate crafts, then transport them to Paris. Certainly a possible task to accomplish, but I wonder if it was really so easy in 1867. A group of 50 including children would probably require recruiting 15 to 25 families. This seems to be a very ambitious plan and if it actually happened I have little doubt they would be very easy to find in Expo literature and news accounts. Since they do not show up in any Expo publications, it suggests this plan never materialized. At least not to the extent suggested by this news report. There is something that caught my eye in this article. In the last paragraph above, which discusses an American restaurant and saloon the name “Big Thunder” is used in reference to the Indians at the Expo. I doubt many of my readers will understand the significance of this, so I will explain. There really is a rather well known Native man by this name in this time period and I have already met him. “Big Thunder” is the stage name of a Penobscot Indian man named Frank Loring. Like U-ta-wa-un, Big Thunder was a master showman. Frank’s career began in the 1840s when he was a young man. He traveled extensively with his own and other’s shows and worked for a time with the ultimate master himself, Mr. P.T. Barnum. So, is this New York Times article suggesting Frank Loring was one of the Indians destined for Paris or did he just grab an Indian sounding name of the top of his head to make his point? Another question I may never find the answer to. I find no evidence to suggest Frank traveled to Europe. Without extensive research, I can’t rule it out either because the man certainly did get around. If Frank Loring did go to Paris with U-ta-wa-un it may explain a few things – or not. By 1867, Frank had traveled with P.T. and had extensive experience entertaining the public. U-ta-wa-un certainly would have had a nice opportunity to learn some new tricks. Now, perhaps Marleah was traveling with Frank in one of his shows and that is how a St. Francis Abenaki from Quebec (via Penobscot Abenaki connections) met and married a Brothertown from Wisconsin. Something to think about any way. During my research I discovered there was another real person by the name of “Big Thunder”. It seems he was a Sioux from the village of “Kaposia” on the Mississippi River. He was also known as “Little Crow IV”. This man died in 1845 so it can’t be him, but it is possible his name was remembered as that of a Sioux chief some 22 years later by this Times reporter. The last item I want to introduce is a cartoon I found published a month after the above article appeared. I recognize it as satire, but I don’t really get the joke. I have been reading about humor during the Civil War and frankly, it’s over my head. I include it here in case any of my readers want to try their hand interpreting it. My best guess is someone at this newspaper has gotten wind of the fact the Native’s being sent to Paris have European names and are perhaps putting something over on the French. But I could be so very wrong. In any case, this paper does seem to have an issue with the Indian exhibit headed for Paris. So here I am, at the end of the U.S. trail leading to Paris in 1867. After a couple of months of exploration, I have far more questions then when I began the journey, and no firm answers. It is time to get onboard and sail for France. I am not holding my breath, but maybe there will be a answer or two waiting for me there. 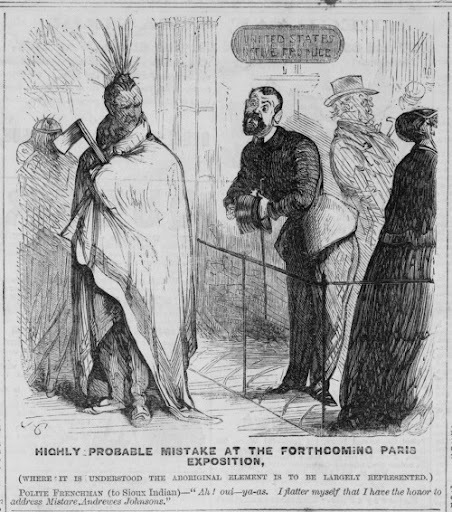 My next post in this series (and I am not promising it will happen soon) will show my readers just what I learned about the Indians that appeared at the Expo in Paris. UPDATE [7-May-2014]: In a recent reviewing of this post, it dawned on me who this Mr. Rowland might be. The Roland Brothers traveled with the American Circus (the outfit that ultimately transported our Indians to France). One of the brothers was an active manager and promoter of circus groups before and after 1867. During my research into the American Circus I found the surname spelled Roland, Rolland, & Rowland. So, now I am thinking Mr. Rowland, the Indian Agent, was in fact a circus agent with a great story he managed to sell to reporters in an effort to pass costs onto the government. The American Circus may have been planning all along to have some Indians as part of their grand performance in France. Once the reporters understood that Rowland was a business man and not a government agent, they began questioning the whole idea, poking fun at it, and pointing out the government should not be footing the bill.